These cards offer an outstanding 0% intro APR on purchases, balance transfers, or both. This can help you finally get your hands on that big-ticket item you’ve been eyeing, or manage debt by transferring an existing balance. Our experts have analyzed 1,002 different credit card offers with a 0% introductory APR period and listed the 10 best no interest offers from our partners to suit different spending habits. See the best 0% intro APR offers from our partners below. The best of us get into trouble with our credit cards. We might have had back-breaking medical bills. Or the car broke down again. The fact is, while credit cards are partly for convenience, sometimes they can seem rather inconvenient because of a steep balance. One of our surveys shows that amongst those who don’t have a plan to tackle their credit card debt, though, 42% gave this as their reason: "I just don’t know where to start." That's where 0% intro APR offers come in. While not a cure-all, a card with a 0% APR offer on purchases, balance transfers or both can help pull you up out of ever-building debt by halting the interest charges that come with carrying a balance. But these offers aren't forever – they can range from 6 months to as high as 18 months or longer, depending on the card. For example, the Citi Simplicity® Card and Wells Fargo Platinum Visa card are well known for their long introductory periods. What is a go-to APR? To understand how a 0% APR offer can work for you, read on. These are our favorite 0% APR credit card offers that give you a long time to pay off purchases and balance transfers. Our top pick is the Wells Fargo Platinum Visa card due to its long introductory offer. Many cards also have great rewards, like the Capital One Quicksilver, which offers a 15 month interest free intro period and 1.5% cash back on all purchases. What are 0% APR credit cards and what does 0% intro APR mean? Here's a shocker: Two-thirds of consumers we polled said they had never applied for a credit card to pay 0% on a new purchase. Yet, used correctly, they are a great way to defer paying off debt temporarily while paying no interest. What are 0% APR credit cards? A 0% intro APR card is a product that offers no interest for a set amount of time, sometimes up to 18 months or longer. These are great cards for paying off a card balance (or two) without incurring more interest charges. They are also good for consolidating debt into a single payment. These cards can sometimes offer 0% APR on purchases for a limited time. What does 0% intro APR mean? A 0% intro APR means that you pay no interest for a set amount of time on balance transfers on credit cards, purchases or both. With balance transfers, you can avoid the debilitating costs of interest fees, which can number in the thousands of dollars over time. For example, if you have a $3,000 balance on a card and you're paying 17% APR, it would take you 126 months to pay the minimum payment each month. That includes the $3,000 plus $2,241 in interest fees. By using a 0% intro APR card, you can avoid the $2,241 charges, provided that you pay off the debt before the offer ends. A 0% intro APR card can sometimes be used for purchases, as well, which is handy if you have a big purchase coming up. When is it beneficial to have a 0% interest credit card? Major purchase. Bought a surprise 50-inch TV for your significant other's Christmas gift, but didn't have the funds to pay for it? A card with a 0% intro APR for balance transfers can allow you to pay over time while paying no interest in 2019 and beyond. Consolidation. Some consumers use a 0% APR card to consolidate debt, placing multiple balances on a single card for one easy payment. This is helpful when you are having trouble making bills. In fact, we found that 42% of cardholders have missed a payment at least once, make this an even stronger reason to use a 0% card for consolidation. Balance transfer. This is the most common use of a 0% interest card. Transfer balances on high-interest cards to a card with a 0% intro APR. Non-card debt. You can use the 0% offer for debt other than card balances, although make sure you will pay it off before the go-to interest rate kicks in. A car loan with 3% interest may not be worth your while to transfer, for example, because the interest is already so low and you don't want to risk having the balance on a card with a considerably higher go-to rate. Emergencies. When a sudden bill comes your way, such as a fridge on the fritz, this is a way to cover costs in the short term. If you time it correctly, you can pay for emergencies within the offer's term. Rewards. If the card has good ongoing rewards, a 0% APR card can be a good choice for the long haul. Look at any rewards a card may have that will make the card worth hanging onto after the balance is paid off. Arguably the best credit card for balance transfers in particular, the Wells Fargo Platinum Visa card features a 0% offer of 18 months for purchases and balance transfers, then 17.74% - 27.24% variable. A notable feature is the benefit of up to $600 protection on your cellphone ($25 deductible, fees apply) against covered damages or theft when you pay your monthly bill with this card. With 18 months of 0 interest on balance transfers, you can pay $50 a month in 6 months with no interest for that trampoline you bought for the kids. Planning a spring skiing trip? You can pay 0% interest until well into 2020. The variable go-to rate is 17.74% - 27.24%, which is quite a high interest rate. Also, there are no ongoing rewards or a sign-up bonus. Bottom Line: Although there are no rewards, the Platinum Visa card is outstanding as a 0% card and you can continue to build credit with it in the long term. The Capital One Quicksilver Card has increased its 0% intro APR period to 15 months on purchases and balance transfers, which is competitive. After the intro period, the APR goes to the regular variable APR of 16.24% - 26.24%. This card doesn't have the high cashback rate of the Chase Freedom, which offers 5% back on rotating categories, although you don't have to think about rotating categories what you're using the Quicksilver. Bottom Line: With no annual fee and unlimited cash back, this card also doubles as a 0% APR card, which means it can be good for the long haul. With a decent 0% intro APR length of 15 months on both purchases and balance transfers, this card matches its competitors in terms of intro length. 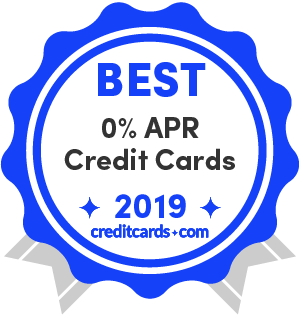 While it is a decent 0% APR card, the CFU's greatest draw is its elevated cash back of 3% on all purchases (up to $20,000 spent) in the first year. Afterwards, it's a competitive 1.5% cash back on all purchases. There are no rotating categories or required quarterly sign-ups to keep up with. With a high variable go-to rate of 17.24%-25.99% APR, the Freedom Unlimited isn't the best choice for carrying a balance after the intro offers end. You can also do better with 1.5% back for certain categories of purchases. Bottom Line: The Chase Freedom Unlimited's 0% intro APR offer is the right choice for a consumer with a moderate amount of debt. The first-year and ongoing rewards are competitive, but the regular APR isn't ideal for someone who plans to carry a balance beyond the end of the 0% offer. With a fun double your cash back at year end, this card can earn you up to $600 in cash back your first year with its 5% back on select categories up to the quarterly maximum of $1,500 in purchases after activating. That's $75 back each quarter with a $500 monthly spend and $300 at the end of the year. Categories for 2019 include groceries (Q1); gas stations, Uber and Lyft (Q2); restaurants (Q3); and the always popular category, Amazon.com (Q4). While decent, 14 months of 0% intro APR on purchases and balance transfers isn't the longest offer out there – if your primary concern is to pay a sizeable balance off while avoiding interest charges, you may want to look elsewhere. There also isn't a lot in the way of purchase and travel benefits with this card. Bottom Line: The Discover it Cash Back has one of the lowest variable APRs among 0% cards, with 14.24% - 25.24%, which is handy if you think you may carry a balance after the 0% offer ends. Also, the rewards are strong, even with no sign-up bonus. The BankAmericard has one of the longest offers on both purchases and balance transfers at 18 billing cycles before the regular APR of 15.24% - 25.24% (variable) kicks in. Not only does it come with no annual fee, but it also has no penalty rate. It is also one of the few credit cards that let you access your FICO score for free. There is a time limit to when you must make your balance transfers in order to take advantage of the introductory rate offer: within the first 60 days. Otherwise, there are not many drawbacks to speak of as this card is quite straightforward. Bottom Line: With no annual fee and a generous offer, the BankAmericard more than viable as a no-interest credit card. The HSBC Gold Mastercard is an extremely solid 0% APR credit card that ticks all of the major checkboxes. It has a very long 15-month intro 0% period on purchases and balance transfers, a low regular APR of 14.24%, 20.24%, or 25.24% variable, no penalty APR, and no annual fee. This card's one notable imperfection is its 4% balance transfer fee (minimum of $10), which is a bit higher than some of our other top picks. Bottom Line: The HSBC Gold Mastercard is a highly efficient 0% APR option with one of the most favorable intro offers of any credit card. The Blue Cash Everyday's 0% intro APR period stands at 15 months for both purchases and balance transfers, after which the regular APR of 15.24% - 26.24% variable applies. This is quite a long offer, and the regular APR is also reasonable if you are able to land on the lower end of that range. Most importantly, the BCE offers a tremenedous amount of long-term rewards value compared to other 0 interest credit cards. You'll earn a phenomenal 3% cash back at U.S. supermarkets on up to $6,000 per year in purchases, then 1%. That's in addition to 2% cash back at U.S. gas stations and select U.S. department stores, 1% back on all other purchases, and a $150 statement credit after you spend $1,000 in purchases in your first 3 months. There are a couple of notable restrictions. 1) In order to take advantage of the 0% APR intro offer on balance transfers, you must complete your transfers within the first 60 days. 2) Balance transfers are capped at $7,500 or 50% of your credit limit, whichever is less. Bottom Line: The Blue Cash Everyday is notable for its long and flexible intro APR offer and stands out from the pack with its top-tier rewards. It's a rarity to find a travel card with a 0% intro APR purchase offer. For 12 months, you will not pay interest on purchases on this card (after that, it's 17.24% - 24.24% variable), all while earning a nice little sign-up bonus, 1.25X miles on purchases and 10X miles on hotel reservations booked and paid through hotels.com/Venture. The VentureOne doesn't offer a 0% balance transfer offer and the purchase offer is relatively short. Look elsewhere for an extended purchase offer. Bottom line: If you crave a travel card while bypassing interest for 12 months on purchases, the VentureOne is a good choice. This card's balance transfer and purchase 0% APR offer is tough to beat, with 20 billing cycles for each. Also, the variable go-to rate is a low 14.74% - 25.74%, just right for paying down after the 0% offer ends. One of the better hidden perks about this card is the $600 cellphone protection ($25 deductible), which comes in handy during unexpected emergencies. This is another card without a sign-up bonus or ongoing rewards, making it a bit of a dubious offer for the long haul. Bottom Line: This card should be one of your top picks if you need a long time to pay off an existing balance or big purchase. In addition to a 0% intro APR for 15 months on purchases and balance transfers (17.24% - 25.99% variable after that), you can earn 5% back on rotating categories (maximum $1,500 in purchases a quarter) and earn $150 after a $500 spend within the first 3 months of card membership. If your priority is getting a long 0% offer, other cards have a longer intro offer. Also, the Chase Freedom has a foreign transaction fee of 3%. Bottom line: Although it's pretty easy to find a cash back card with a 15-month 0% intro offer on balance transfers and purchases, the Chase Freedom's partnership with the cards that have Chase Ultimate Rewards boosts makes it one of a kind. A go-to APR, or regular APR, is the rate you pay once a 0% intro APR period ends. The go-to rate can easily be 16% or more, so it's in your best interest to work on paying off the balance before the introductory offer ends. That means paying considerably more than the minimum payment. However, life sometimes gets in the way of our best intentions. There may be a need for you to carry a balance after the offer ends. In that case, it's a good idea to know what variable rate is offered by the card you are eyeing. Interest rate – With a credit card, the APR, or annual percentage rate, is the same figure as the interest rate. However, with other products—such as mortgages—your APR reflects not only the interest rate but also any points, mortgage broker fees and other charges that you pay to get the loan. For that reason, your APR is usually higher than your interest rate, the Consumer Financial Protection Bureau says. APR – While APRs are designed to reflect the cost of a loan over time, in the case of a credit card, it's used to calculate interest that accumulates daily. You can have different APRs associated with your credit card, such as for cash advances or balance transfers. Prime rate – The U.S. Prime Rate is a commonly used, short-term interest rate in the banking system of the United States. All types of American lending institutions (traditional banks, credit unions, thrifts, etc.) use the U.S. Prime Rate as an index or foundation rate for pricing various short- and medium-term loan products, says FedPrimeRate.com. Variable APR – An APR range that card issuers offer in which you are issued a rate based in part on your credit rating. What is the average interest rate on a credit card? What is good? The national average was at 17.68% the week of April 8, a historic high for credit cards. The average rate among low interest credit cards is currently 14.69%. Usually, the rates are variable and depend on the Federal Reserve's rates as well as your payment habits. In the case of 0 APR cards, the lower rate on the scale is often below the national average. What determines the APR on a credit card? Credit card issuers assign an APR to your account, based in part on the Federal Reserve's rates, your payment habits and your credit score. The card issuer's interest for that card also influences your rate. Typically, issuers offer a variable rate and you are assigned a rate within that range. If you have been paying on time and you have been keeping your balances low, you have a higher chance of a lower rate. Purchase APR – This APR is applied when you make a purchase. When you allow the balance to carry over past the grace period, you face interest charges. This is the most common interest rate on a credit card. Balance transfer APR – When you transfer a balance to a new card, you can be charged this rate, although there are many cards on the market that don't charge interest for a limited time when you transfer a balance. It is possible for this rate to be greater than the purchase APR, although that's unusual. Penalty APR – If you aren't making payments – in other words, you are delinquent – you can face this rate. This rate is quite a bit higher than the other rates. Cash advance APR – When you take out a cash advance, such as when you make an ATM withdrawal, you are charged this rate. While not as high as the penalty rate, it is typically higher than purchase or balance transfer APRs. There is no grace period with a cash advance, so count on being charged interest from day one. Why are credit card rates so high? Credit card issuers don't just charge high rates because they want to gouge the consumer ‐ they face significant risk when they issue a credit card. Why? Because they are committing to lending you money, just as when a bank grants you a mortgage or car loan. However, cards differ because they are what is called an unsecured product, while a loan to buy a car or house is secured. That means that with a card, there is no collateral, or an asset the lender can recover if you don't pay them their money back. Also, unlike a lending product such as some student loans in which the federal government may back the loan, no one is backing the loan you are taking out with a credit card every time you make a charge. How do you calculate interest on a credit card? When you carry a balance from month to month, you face an interest rate called the Annual Percentage Rate, or APR. The rate depends on several factors including your credit score and the card's variable rate. You are charged interest when you carry a balance, once the grace period ends. In some cases, such as when you take out a cash advance, there is no grace period. There are two balances on your card when you have a 0% intro offer: the one with the offer and the one without. While your APR is expressed in a year, according to Discover, card issuers use that figure to calculate charges over your monthly statement period. The easiest way to calculate the interest you owe is to check out the CreditCards.com calculators. With these calculators you can figure out how long it will take you to pay off a balance with the minimum payment; how to maximize paying off the balance within a specified amount of time or amount each month; or figure out your payoff with a balance transfer calculator. "To find out how much interest you're paying on your balance each day, you can convert your APR to a daily percentage rate. To do so, divide your APR by 365, the number of days in a year. At the end of each day, the card issuer will multiply your current balance by the daily rate to come up with the daily interest charge. That charge is then added to your balance the next day, a process called compounding. "If your credit card has an APR of 15%, it will have a daily rate of .041096%. Let's say a cardholder has a balance of $1,000 at the 15% APR standard interest rate. The next day, interest is added and the balance becomes $1,000.41, plus any additional purchases and minus any new credits or payments. This process occurs each day until the end of the cardholder's monthly statement cycle. So, at the end of the month, the beginning $1,000 balance becomes $1,013 when interest charges are applied at 15% APR." How do you avoid paying interest on a credit card? Credit card debt is on the rise, according to the Federal Reserve of New York. In fact, in Q4 of 2018, 4.99% of card accounts were delinquent for 90 days or more, compared to 4.80% the previous quarter. Also, debt was up by $36 in Q4 of 2018 compared to the previous year, according to the New York Fed. With credit card debt hanging over you, you also face the struggle of incurring additional debt in the way of ever-building interest charges. The best way to avoid paying interest on a credit card is to pay in full before the due date each month and don't put a charge on your card that you don't already have the money for. Another way to avoid paying interest is through the use of a 0% intro APR card. With these cards, you have a set amount of time when you can pay off the balance without incurring interest charges. But heads up: You'll need to pay more than the minimum. Don't transfer to a new card. If you have a balance left over after the 0% intro offer ends, avoid temptation to just transfer the balance again, partly because you aren't solving the problem by doing that, but also because lenders may see what you are doing and deem you a risk. Keep the card. Once the debt is paid off, don't close the account. Also, put a small charge on it each month and pay in full to keep the account active. This helps you build your credit. Be sure to pay on time, every time. Is there an annual fee? One reason to close the account is if there is an annual fee that isn't counterbalanced by rewards that you'll use. That said, keep in mind that closing the account can harm your credit if you have a card balance elsewhere. Keep using the old card. You should still use your old card, putting a small charge on it and paying in full each month. As with the balance transfer card, this helps you continue to build your credit. Stick to your budget. There's no point in paying off the balance if you haven't addressed what got you there in the first place. Create a realistic budget with room for fun and savings, so you'll stay true to it. Because there are so many factors when choosing a 0 interest card, you need to make sure you are comparing apples with apples. Is there a balance transfer fee? Do the cards offer sign-up balances? What's the 0% APR offer? The answers to these questions will help inform your decision, which we look at below. What is the 0% offer's term? There's no point in getting a card with no balance transfer fee if the offer's term isn't long enough for you to be able to pay back the debt before the offer ends. In that case, another card may be worth your while. What is the deadline? Often, cards require you to make the transfer within a set amount of time to get the balance transfer fee waived. Make sure it's a deadline you can meet. If you plan to transfer the balance after the offer ends, make sure you budget the balance transfer fee. Is there an annual fee? Cards with no balance transfer fee often have no annual fee. If there is an annual fee, that cuts into your savings with the waived balance transfer fee. Do you plan to make a large purchase soon? Check if the card with no balance transfer fee has a 0% intro offer for purchases if you plan to use the card to make a major purchase, such as plane tickets to the Bahamas for Spring Break. Otherwise, using the card for new purchases and not paying in full can undercut the savings from having the fee waived. What's the sign-up bonus? Some 0% APR cards offer a sign-up bonus of up to $200. What are the ongoing rewards? You can probably find a 0% APR card with rewards of at least 1% cash back. Is there an annual fee? An annual fee might be required, but it can be an indication that the rewards are superior. Does it have a 0% APR for purchases? Do you need it? Some cards don't have intro APR offers for purchases, so check, if you plan to make a big purchase soon. As you can see, while the Quicksilver is a good use-it-and-forget-it card, the Blue Cash Everyday is ideal for the family that cooks at home. With both offering 0% APR for 15 months on purchases and balance transfers, they provide cover for a little over a year. Zero interest credit cards are among the best weapons in your financial arsenal when you are trying to pay down debt. But they can beat you down if you don't use them correctly. Here, we look at what happens when they are used incorrectly and the right way to use them. It's all too easy to get behind on your credit card debt. In fact, our survey found that a third of those polled reported having had more than $5,000 in card debt. Don't fall down that path; use our tips to help you pay down your debt and avoid it in the future. What can go wrong when you use 0% interest cards incorrectly? You fail to pay your monthly bills on time. If you violate the agreement, for example you don't pay on time, you can lose the 0% offer. Always pay on time and don't go over the limit. You don't pay off the balance in time. If you don't pay off the balance by the time the offer ends, you will incur interest charges for the leftover amount. You use the card for new purchases. If you use the card for new purchases outside of a 0% offer for purchases, you will incur new interest charges, basically negating the savings you'd otherwise enjoy. What is the right way to use 0% interest cards? Budget for the balance transfer fee. In most cases, there's a balance transfer fee of 3%-5%. Make sure you'll benefit from the balance transfer even with the fee. Some cards, such as the Amex EveryDay†, waive this fee within a set amount of time. Read the terms. Make sure you are clear about how much time you have to make a purchase or transfer. Also, check the fine print for details about fees and penalties. Pay it off quickly. Pay off as quickly as possible, because your credit score looks at both your individual and combined available credit, so a maxed-out balance transfer card can negatively influence your score. Avoid new purchases. Avoid new purchases on the card unless you have a plan to pay it off before the purchase terms end. If there is no purchase intro APR, don't put new charges on the card, because you can end up incurring interest with those charges.